Remember I told you yesterday that I had a very productive and wonderful weekend? And that I'm very, very sore ever since? Yup. Getting old. How did that happen? 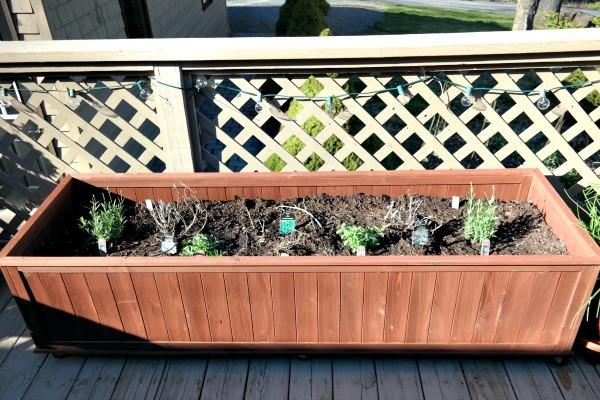 Well, part of what made me so happy....and so incredibly sore....was creating my new herb garden up on my deck. I did think about putting the herb garden down on the stone patio, but I really wanted the herbs right outside the kitchen door. It just makes the most sense - after all, that's where the magic happens, right? And now I look out my kitchen window and I feel all fancy, like I have a potager in Provence. Anyway, here's how it all went down. On Saturday the weather was just perfect to be working outside. 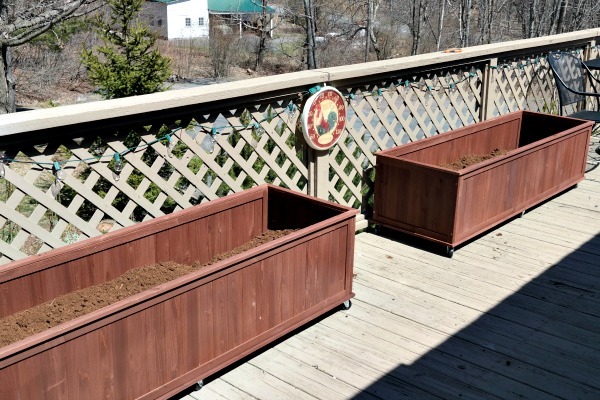 I was puttering around the house and gardens doing this & that...and Sweetie came to my house and spent time on the deck putting together my two new herb boxes. I was so excited!! I know, don't judge....I'm pretty lame, no doubt. To make the boxes more practical, I bought 12 casters so Sweetie could put 6 on each box. This way they can be moved for cleaning, deck painting, etc. As soon as they were all assembled I used my superhuman strength to carry two huge bags of peat moss up a flight of stairs to dump in as the first level of soil. Peat moss is great as a bottom layer in a large planter like this. It's lightweight, helps keep the nutrients in the soil, is relatively inexpensive for the amount that you get, and of course it's organic. 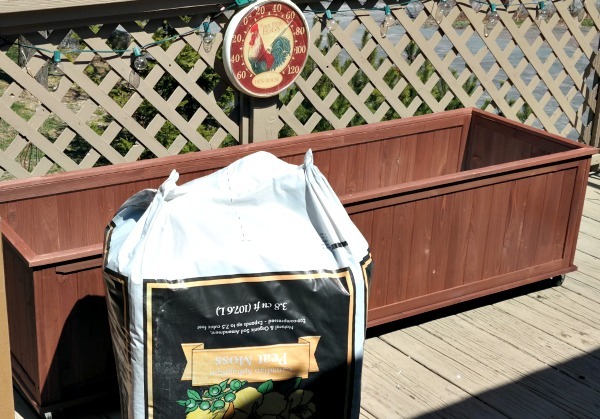 To find out more about peat moss's wonderful uses in the garden, check out this article. The next layer in the planter boxes was the beautiful compost my sweetie brought over in 5 gallon buckets. Another heavy load to carry up the stairs! For the top layer, I had to run to our local Ace Hardware and pick up some organic potting soil. I bought everything they had left in stock. I'm pretty sure that all the staff members at Ace are convinced by now that I'm crazy. It may or may not be true. I'm not saying. Anyway, once I had all the layers in the boxes I used my Garden Weasel to mix it all up. I truly love that garden toy. Remember I told you all about it in this post? When the soil was ready to go, I headed over to the veggie garden to dig up all the perennial herbs and re-plant them in the new boxes. I'm still not sure what's going to come back after those cold nights we had, but I'll find out soon. I also added some herbs I picked up when I was off the mountain . Box number one has Lavender, Purple Sage, French Tarragon, Lemon Thyme, and Italian Oregano. And I seeded some Dill in the back. Box number two has Rosemary, Greek Oregano, Garden Sage, Sweet Marjoram, German Thyme, and Dill seeded in the back. I still need to add Basil and Parsley after the danger of frost....and who knows what else. Possibly some Savory or Chervil. The Mojito Mint is in a separate planter so it doesn't take over the world. Same with the Chives - I dug them all out of the veggie garden and potted them up. 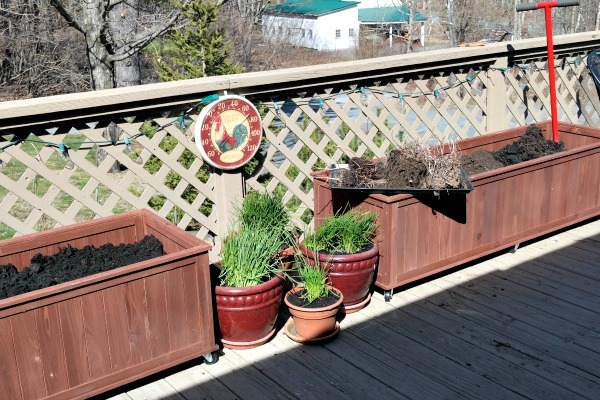 The herb garden is right outside the kitchen door, on the other side of my L-shaped deck from the dining and firepit seating areas. There is some additional seating on this side of the deck, along with the barbecue and the hose. 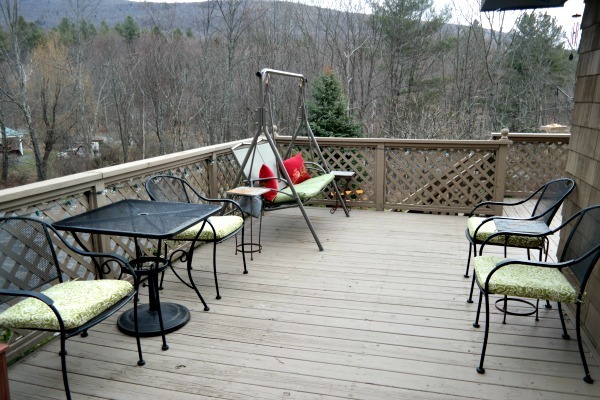 At the corner of the L, by the tall staircase leading to the stone path and parking area, is my deck swing. Not to be confused with the swing by the garden cottage, which is new this year. I am so blessed, no doubt. The deck swing has been in 3 homes with me so far and I love it. 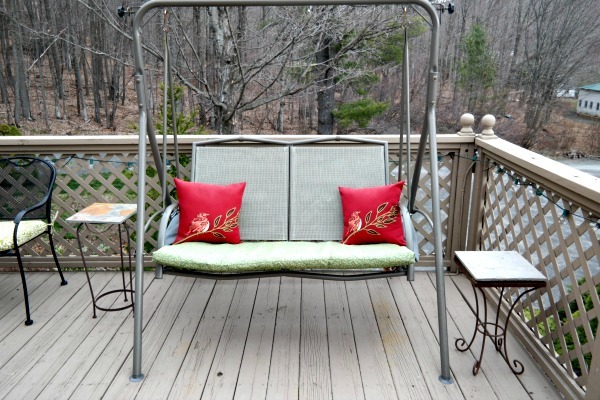 This swing faces the dining table and firepit area, as well as the bird feeders. It's a fantastic place for morning coffee. Looking back towards the kitchen door, smaller staircase, and garage you can see the herb boxes on the right. 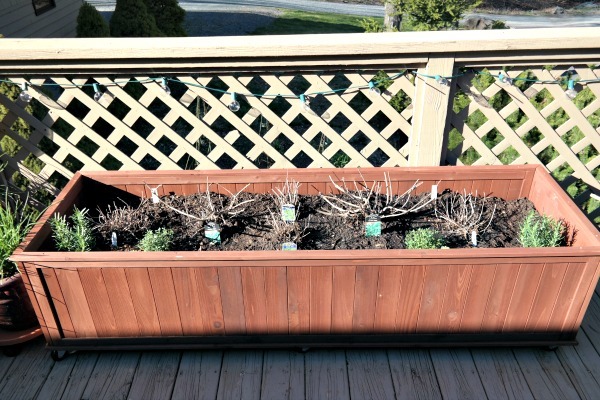 I just love my new herb garden and can't wait until the herbs really start filling in those boxes! I have plans to add a vertical element to the herb garden as well....stay tuned for more on that. 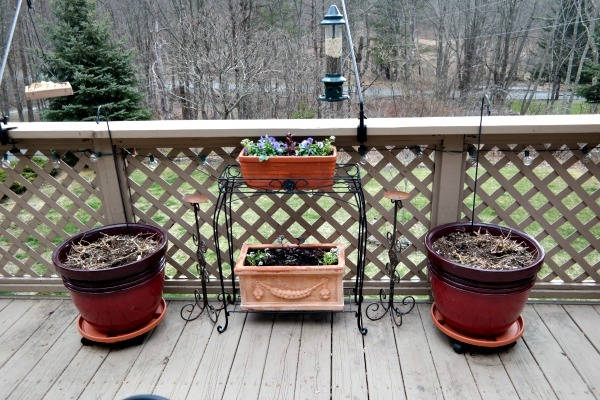 The large red container in the corner will be planted with colorful annuals, with something tall in the center. I have two more large red containers, and all three get planted the same for continuity. While I was at it, I did another very, very smart thing, that I should have done ages ago - I added wheeled saucers under all the planters on the deck. It will make things so much easier when trying to clean up the deck because these red planters seriously weigh a ton! But do you want to know what the real star of the show was this weekend? This little guy. Oh my, he saved my back! I sat on this little stool and did all the planting in the herb boxes, scooting from one box to the other like I was in a race car! My sweetie gave me this little stool a few years back as one of my Christmas gifts. I didn't quite know why he would be giving me a mechanic's wheeled stool....until he explained it was for me to use when working on my deck planters. Did I ever tell you how smart my sweetie is? But don't tell him I said that. I wouldn't want it to go to his head. I have herbs growing on my deck too! I just planted basil, oregano, rosemary, parsley and dill. There is a big plant sale at the Nature Center this weekend so there will be more! I planted some lemon balm in a separate pot because I read that its a good mosquito repellent. Supposedly you just break off a few leaves and rub them on your skin and no more mosquitoes bothering you. Have you heard that? I'll let you know if it works! That's a great tip, Diane! I had Lemon Balm in a garden previously, that I had started from seed. It pretty much took over the garden, so maybe I'll put some in a pot! They sell citronella plants also to help with mosquitos....I am going to look for those also! That genius move was all mine, not sweetie's - although he was the muscle behind that one! Wow. So much work and organization. My back feels for you. Love all the casters. I've always wanted to do that. Back in the old days when we had pot plants all over the house (70s?) I had my pots on casters. I don't have a lovely deck like you so no casters this year. It makes so much sense, Barbara, and I should have done it years ago! That looks really nice. All I have is some Mint growing in a pot. I want to grow some chives and cilantro. Chives are awesome, Lisa, because they will come back every year, and they come back early - you can use them in cooking for about 9 months out of the year! I am not a cilantro person - they say either you love it or you hate it....well, I'm one of the latter unfortunately! You are going to have some amazing herbs, my friend! Did I hear that you and Doreen are going to meet?? How wonderful! We met on Sunday, Jemma - it was such a great day!! I'm feeling stronger today and ready to tackle planting the veggie garden this evening after work! This will be wonderful...look at that nice sunny spot! I can't wait to do a little planting here! I'm watching the weather very carefully - I can always throw a blanket over things if I need to....but I'm hoping sincerely that I won't need to! The casters were a smart move. 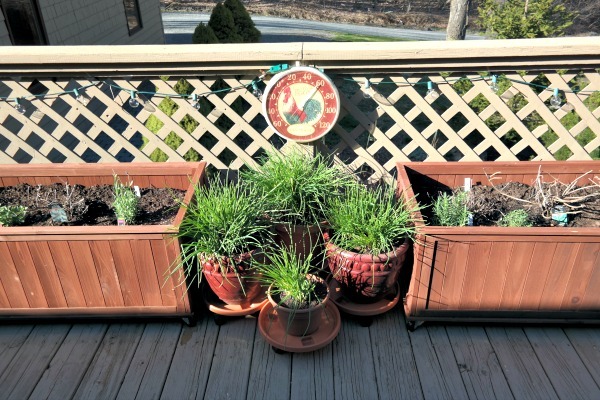 Also the herbs on the deck will keep more insects at bay. Have you considered growing vines up those trellises (is that what those things are called that go up from the deck? I'm tired and can't think of my words right now. Anyway, I've got clematis in a container. Passion vine would be pretty, not to mention morning glories and moon vine to light up the night. I grew Morning Glories and Gloriosa Lilies up the lattice on the deck railings last year....this year I have another idea up my little sleeve! Perhaps you can find another spot to do it, Debbie? Raised beds are certainly a whole lot easier for planting in our mountain regions.....let's face it, mountains are big rocks so holes in the ground can be awfully tough to dig!! It looks like the start of something big! So glad you had beautiful weather for this project. I think adding wheels to everything is brilliant. Why not make you life easier. Hope you get lots of sunshine and just the right amount of rain! Thanks for joining us at The Maple Hill Hop! The weather is gorgeous today also, Daisy Gurl - I got some garden chores done this morning already and can't wait to get my veggie garden planted! What a beautiful haven you are creating! Now you really won't want to leave for work in the mornings! 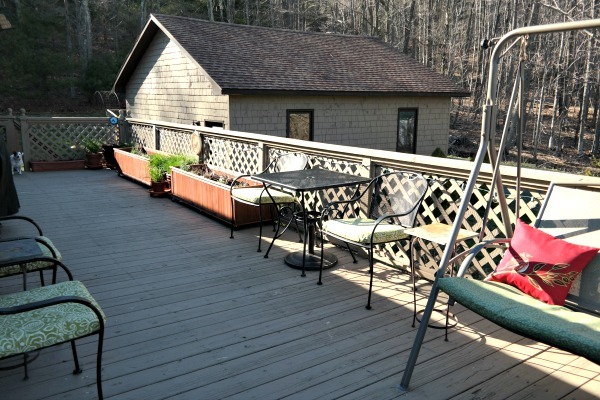 LOL I can't wait to see your deck...well, actually your whole backyard, this summer. It's going to be GORGEOUS! Let's hope, Mimi - with this weird weather we've all been having this past while who knows what may happen....fingers crossed for a good gardening season! Wheeled saucers, genius! I'll be looking for a few of those! They were a third cheaper at Lowe's than on Amazon....I picked them up there when I was off the mountain. 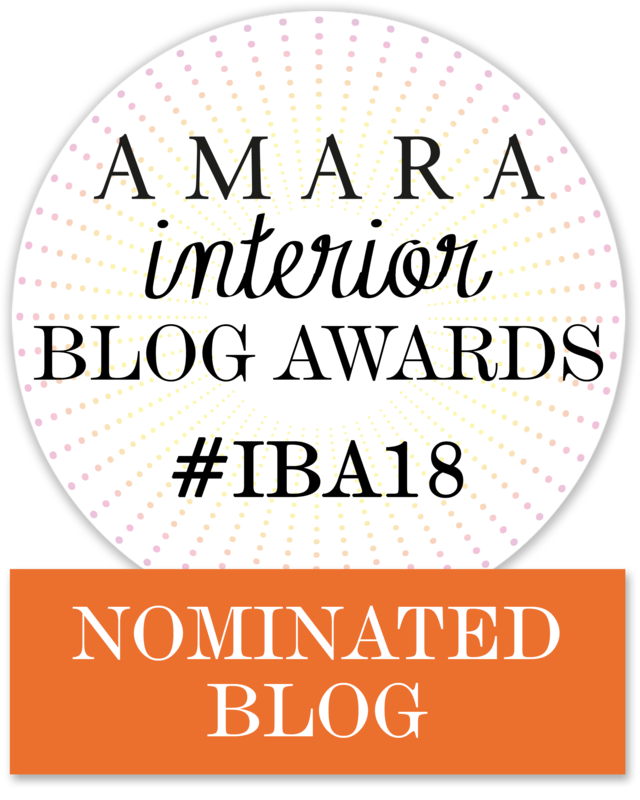 You may want to shop around! Can't wait to see your planters mid-summer when they have filled out. I love the idea of putting wheels on the planters...makes it so much easier to move if necessary. I can't wait to see them myself, Marigene - I'm looking for signs of life ten times a day now on the herbs I dug out of the veggie garden! My hubby made me a small herb box for my deck last year. I absolutely loved it, and can't wait to see what comes back from last year. Enjoy yours! And now, I've got to get me some wheeled saucers! 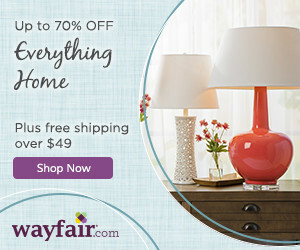 You should look for them at Lowe's, Amy - they are a lot cheaper than on Amazon. What a great plan - when cooking, the herbs are fresh and close by! That's a great approach. Thanks for sharing and linking so many helpful posts. I love the thought of being able to easily go out onto the deck and snip some fresh herbs when making dinner....or an omelet! Your herb boxes are going to be overflowing with lush beauty soon! It will be so wonderful to just walk out the door and cut your own fresh herbs for cooking. I have a little herb garden in my back yard, so I have to take a little walk when I'm cooking, but that's fine. It thrills me to have my own herbs for cooking. (See? I'm lame, too!) 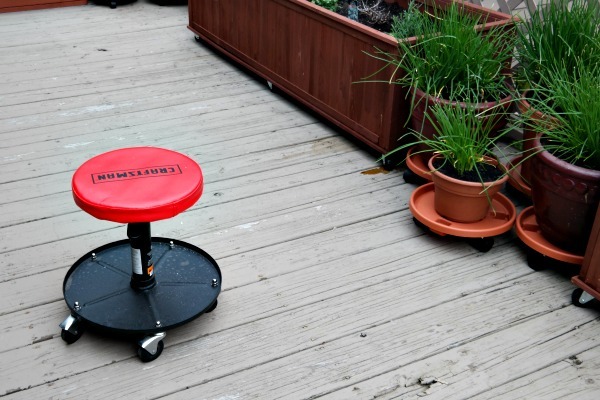 Love the wheeled stool you have to sit on for planting - perfect! It's nice to have an equally lame friend like you who commiserates with my insanity!! Another reason I wanted to move the herbs from the veggie garden is to make room for more veggies - they took up a lot of valuable real estate!! It was such a back saver, Sheila! And let's face it, after carrying up all that soil to the deck, I was pooped!! 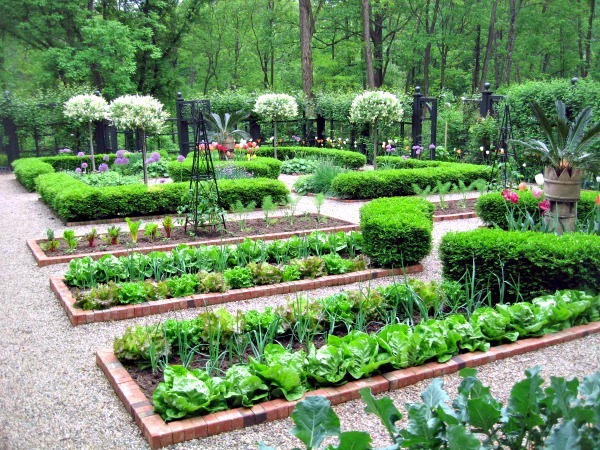 You are a prolific gardener and very dedicated to you vision!! That was a lot of work!! It will be worth it in the long run, Kim! Love your herb planters! The mechanic's seat is pure genius...shhh, don't tell you sweetie I said that...ha! Ha ha, I won't tell if you don't, Donna! You were a busy girl! No wonder your back hurts. Those planters are all going to look so wonderful and be so practical once everything fills in! They will be overflowing for sure, Debbie - can't wait!! You're like the energizer bunny! (I pinned your quiche and am planning to use the pic in Saturday's post with a link back. I assume that's ok, but if not let me know). What a great variety of herbs. Do you use all of them for cooking? I planted some purple basil simply because it is so pretty. I also planted mint (for tea), chives, parsley, rosemary, and sweet basil - I'll use all of these. It's really amazing at all the things one can do simply in pots on the deck. I use all but the lavender for cooking - that one I plant just because I love it! Oh, I wish I could do this on my back deck, no one uses it because it faces South and so hot that it's impossible to grow anything. I just hang bird feeders up. I would love to have some sort of fabric covering that would diffuse the sun. Your garden looks so nice. That would be nice, Kathy - perhaps one of those fabric covered gazebos? You can buy them all over the place now and they are wonderful! I had one in a previous home. 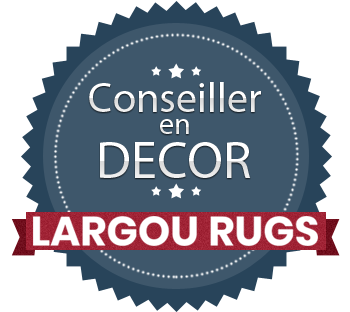 Thanks for visiting my little blog!! Fantastic! I can't wait to see how your herb garden grows. What an absolute delight this post is!!! Thank you so very much for joining the gathering at Thoughts of Home on Thursday. I'm out there every day looking for signs that those perennial herbs are still alive - so far only the garden sage is growing! Our Garden Party is Monday April 25th. I hope you can come! I'll be there with garden bells on!! Love your herb garden! It will be producing great ingredients (and aroma) to your deck and kitchen many months to come. You better believe it, Lori - and then herbed butter for the freezer when I have to harvest before the frost! You're so smart! I love the idea of putting casters on the herb boxes. I bought some basil yesterday and will incorporate it into a pot of flowers. Worked last year so I'm repeating that process. Your place is so beautiful!! Do you get lonely out there? Thanks for sharing your herb garden and beautiful yard with SYC.